It’s a new dawn for international football so, fittingly, the build-up to the start of the UEFA Nations League has been accompanied by a considerable amount of darkness. Across the week, a number of Irish players have taken questions about this new initiative and they have stopped short of going into details of its importance. That’s because it is tricky territory. Some Irish fans only really grasped that the four games with Wales and Denmark were competitive when they were confirmed as a vehicle to tie down Declan Rice’s allegiances. 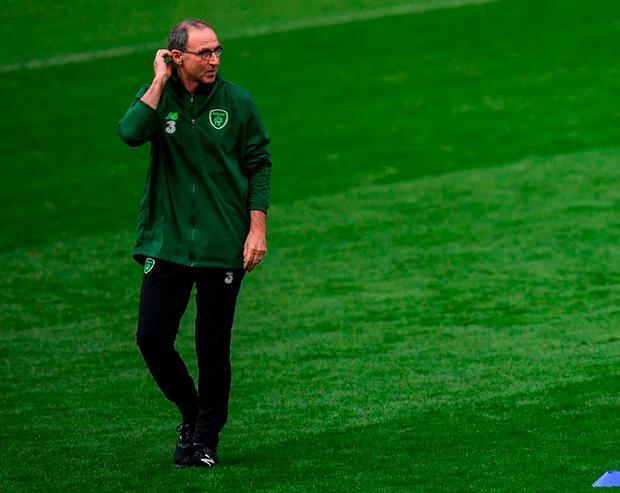 And Martin O’Neill admitted that the idea of delaying the start of regular qualifying did not appeal to him until the value of this exercise was laid out. “There seems to be a feeling that nobody totally understands what it’s about,” he said yesterday. Here are the main questions that needed answering. Why was the competition introduced? This is UEFA’s solution to the unattractiveness of international friendlies. Regular qualifying for Euro 2020 has been pushed back to 2019 where the traditional campaign will be crammed into a year. Every second autumn – after major tournaments – the Nations League will be played in September, October and November. The 55-member nations have been divided into four leagues – League A, B, C and D – according to their UEFA co-efficient. A and B have 12 teams in them, while C has 15 and D has 16 teams. Each league will be divided into smaller pools. Ireland are in Group 4 of League B where they were drawn with Wales and Denmark. The winner of each group will move up to League A for the next round of the Nations League, while the bottom side will fall down to League C.
In the summer of next year, the four group winners in League A will come together for a tournament to crown the Nations League champions. What’s the selling point here? For the powerful nations, the carrot is more matches against each other. But the real political thinking behind this idea comes to light with the certainty that one team from each league is guaranteed a place in Euro 2020. In other words, one of the 16 lowest-ranked nations in D will go through. Azerbaijan, Macedonia, Belarus and Georgia are the big guns in that section. It’s no surprise it passed the vote. So a strong performance in the Nations League can help you get to Euro 2020? Yes. Firstly, results in the Nations League will decide the seeds for December’s qualifying draw in Dublin. If Ireland finish first or second in their group they will be in Pot 2. If they finish bottom, they face a stiffer task from Pot 3. But the real point that matters is that the Nations League route has replaced the play-offs in the scramble for the final four places. Ireland qualified for the 24-team Euro 2016 after finishing third in their group, and then bettering Bosnia over two legs. If Ireland finish outside the top two next year, their fate will be determined by the new tournament. How will that process work? In regular qualifying, two teams will go through from each of the 10 groups. Then, the last four places go to the sides that come through the Nations League play-offs in March 2020. The four highest-ranked sides in each league (16 in total) who have failed to get through regular qualifying get another shot via a mini play-off tournament – a one-legged semi-final and final. It means Nations League results will be pivotal in League C & League D given only a handful of sides in C and possibly none in D will make it the traditional way. By contrast, it’s possible the bulk of the 20 regular qualifiers will come from Leagues A and B so the chances of a back-door ticket in a play-off are higher. If Ireland struggle in regular qualifying, but eight of the other 12 sides in League B go through, they will definitely get a second chance. If seven go through, then UEFA Nations League results will decide which one of the other five nations miss a play-off. However, the other possible way back in for teams in League B is that if 10 teams go through from League A then any teams that are set to miss out from the league below get bumped up to fill out the League A play-off competition. Put simply, teams in League A and League B would have to endure a shocking run of results to be out by March 2020. The downside of a poor Nations League result and relegation to League C is that it could complicate the route to future tournaments. So we won’t know if the games truly mattered for a year? The short-term seeding implications are important, but these are effectively results that are being banked away for a rainy day. So where can I watch it? Tonight’s game – and the rest of Ireland’s UEFA Nations League matches – will not be shown live on terrestrial channels. Sky Sports bought the exclusive rights for all of the Irish fixtures in the new competition, and therefore also hold the rights for next month’s Dublin double-header with Denmark and Wales, and November’s trip to face Denmark. However, Virgin Media Three (the channel formerly known as be3) will show full delayed coverage and highlights of the games. RTÉ do have the rights for Ireland’s regular Euro 2020 qualification campaign which kicks off next March. Ireland finish 1st in their Nations League Group? What happens if Ireland finish 2nd? What happens if Ireland finish 3rd?